No. 5/4 Duke and Georgetown advanced to the Championship Game of the 2K Classic benefiting Wounded Warrior Project in front of 18,238 fans at Madison Square Garden. The two storied programs will meet at 1:00pm (ET) on Sunday at The Garden. The game will be followed by the consolation match between Wisconsin and VCU. In the semifinal opener, Georgetown outslugged Wisconsin, 71-61. The Hoyas were led by Isaac Copeland and his 15 points and eight rebounds. Reggie Cameron, who hails from just across the Hudson River in Hackensack, N.J., tallied 14 points. Another New York area player, Jessie Govan from Queens Village, N.Y., had 13 points and D’Vauntes Smith-Rivera added 12 points. Wisconsin received a game-high 22 points from Nigel Hayes and 12 points and 11 rebounds from Ethan Happ. In the nightcap, Duke fought off a tremendous VCU effort in securing a 79-71 win. Ten times the game was tied and there were seven lead changes before the Blue Devils pulled away midway through the second half. 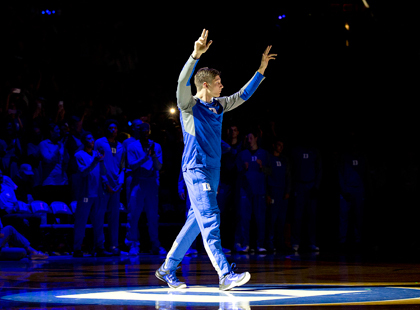 Grayson Allen netted a game-best 30 points on 9-of-15 shooting from the field, including four three-points, and 8-of-9 from the line. Derryck Thornton had 19 points and Mat Jones posted 10 points and six rebounds. Melvin Johnson, from the Bronx, scored 20 points to pace the Rams. Mo Alie-Cox had 15 points and Ahmad Hamdy Mohamed had 10 points. In Subregional Round action in Smithfield, R.I., Siena and Bryant advanced to the title game tomorrow. Siena earned a 76-62 win over Radford while Bryant moved on with a 71-58 win over Prairie View A&M.